"Although I trained to be a Music Educator, I became a performer and professional musician because of the well-rounded educationfrom Baylor University's Music Education Program and the opportunities that were presented to me." Jake Hale is currently the principal clarinetist of The Shreveport Symphony Orchestra. He has performed as the second/Eb clarinetist of the Waco Symphony Orchestra and has performed with The Corpus Christi Symphony Orchestra, The Odessa-Midland Symphony Orchestra, and the Round Top Festival Institute Orchestra. He has competed in the International Clarinet Association Competitions making several appearances as a semi-finalist and finalist. In 2015, he won the Orchestral Audition Competition and the same year made finals in the Young Artist Competition as the only American to advance. Jake is from Fort Worth, Texas and currently studying with Richie Hawley at Rice University pursuing a Master in Music Performance. He received his undergraduate degree in Music Education at Baylor University in Waco, Texas where he studied under Dr. Jun Qian, Dr. Vanguel Tangerov, and Alan Olson. While at Baylor, he played in the final round of the Baylor Concerto Competition in 2014 and 2015 and his woodwind quintet, Connect5, advanced to the Semi-finals of the Coltman Chamber Competition. 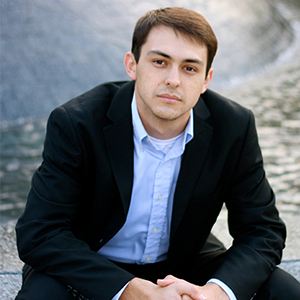 Jake has also studied with Dr. Richard Shanley and Ivan Petruzziello of the Fort Worth Symphony. Jake enjoys running, exercising, and teaching his clarinet studio in Texas. Jake is a sports fan and during the football and basketball seasons, he supports the Baylor and DFW sports teams. He owes his success to his friends and supportive parents who give him inspiration to create music and to pursue exquisite music making.